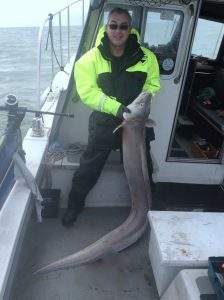 We specialise in deep sea fishing and wreck fishing trips off the Sussex Coast. The English Channel has claimed many hundreds of ships that have succumbed to it over the centuries. All for a variety of reasons, whether through collision, rocks, wind and waves or war. Over a thousand ship wrecks are known about. Our deep sea fishing and wreck fishing trips will give you access to approximately 200 shipwrecks in this part of English Channel. By their very nature, a wreck will hold fish. It will provide cover and shelter for fish to hide in and provide them a food source. There is also a huge amount of marine growth, providing a food source to many organisms. These in turn become food for larger predators. To enjoy a day’s wrecking aboard She Likes It II. Use the Contact Us Form or give me a call now on 07754 324270 to work through the options. 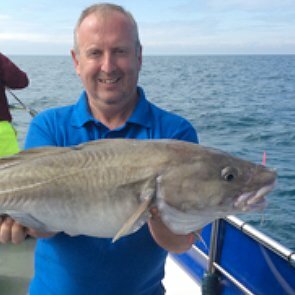 The wreck fishing season generally runs from January until November, with the main target species being Cod, Pollack, Ling and Conger. During the summer and into the autumn there is also some excellent Black Bream and Bass fishing to be had. If you are new to deep sea fishing or deep sea tactics, you can simply turn up. Then hire the tackle from us and enjoy your day – we’ll show you what to do. If you’re bringing your own tackle or simply want more advice about how we fish the wrecks, continue reading. The wrecks we fish are generally lying in depths of around 45 – 65 meters. 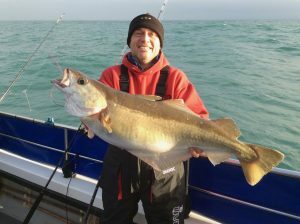 Most are reached within 60 to 120 minutes from Shoreham which maximizes your fishing time. Deep sea fishing and wreck fishing can be quite a challenge. You will be working your lure non-stop in the depths. The fight you will get from a powerful Cod or Pollack diving back to the wreck is an experience. It can be very exciting fishing, with potentially excellent results – but it is physically hard work. If you are a beginner, or would like a more relaxing day out, you might prefer a ground fishing trip instead. But I will happily show you what to do if you’re new to wreck fishing. Why not give it a go. For most of the year the year we fish the deeper offshore wrecks by drifting with lures in search of Pollack, Cod and Bass. The boat is stopped up-tide of the wreck and the tide drifts the boat over it. You work your chosen brand of lure up and down by slowly reeling up (typically 20-40 turns) then dropping it back down and and repeating the process until the end of the drift. The boat motors back up-tide and process is then repeated. It is not unusual to visit several wrecks on such trips. Lures used include Shads, Jellyworms, Sidewinders and Redgills. These are currently the most popular and effective in use. For Cod and Pollack the reliable colours are black, rhubarb and custards, white and blue or imitation Mackerel coloured. I personally find a modern, decent 20-30lb class rod, matched to a medium size multiplier with braid as preferable. Your braid should be around 30lbs with a 25lb mono shock or rubbing leader attached. A flying collar rig is the ideal. With the modern weighted lures your hook length trace should be around the 8 to 9ft mark and about 15-20lb breaking strain clear mono or better still fluorocarbon. Un-weighted lures such as Jelly Worms and Redgills benefit from a longer hook length of 10-12ft. If we are “Hopping” or “Whiffing” for Cod, this is shortened to around 2ft. As for weight, I find 10oz of lead just about covers it in most conditions. It is important that everyone aboard is using the same amount of weight. This reduces the incidence of tangles. 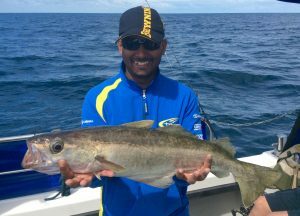 From around July to November, fishing a wreck at anchor with baits is often more productive than using lures. We do require a much smaller tide though to anchor in deep water. Even then, in 60m of water you might need up to 2lb of lead to hold the tackle on the seabed. 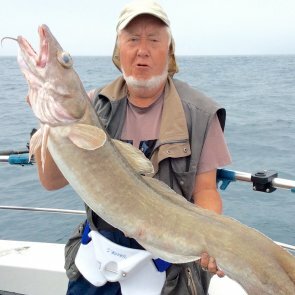 On these trips we target large Conger Eels, Ling and Cod. We can also fish for the specimen sized Black Bream that are on the wrecks at this time of year. We’ll be fishing hard on the bottom with Cuttle Fish, squid and Mackerel baits, the Mackerel we catch fresh on the way out. Once we arrive, the boat will be positioned and anchored uptide of the wreck. I ensure that the boat is settled in exactly the right position, with your baits trailing back towards the wreck, hard on the bottom. Weights will be heavier than when drifting, typically 12oz to 2lb depending how much tide is running and how deep it is as we need to keep your large baits nailed to the seabed. Although most 20-30lb class rods will handle it (Not all) and because we are using more lead and targeting larger fish it might be wise to step up your gear to 50lb class rods. Again with suitable reels spooled with braid. Braid is a must with the deeper wrecks as there is too much stretch with monofilament lines and therefore it can be very difficult to feel the bottom with the weight. A reasonable 30lb class setup can handle even the biggest Congers if you play the fish with care. It will take you for an exciting ride though. Rigs, for the most part need to be simple, just a running ledger is fine. Booms and bits and bobs all add drag that require more weight to be added to keep it all on the seabed.For Conger and Ling your hook length should be around 3-4 feet of 150lb -200lb mono with an 8/0 to 10/0 hook. Tip: – Conger and Ling. Get a set of large hock eye feathers for Cod and bait them up with chunks of Mackerel. Fix your Conger trace to where the weight is attached and bait that with Cuttle (Conger love Cuttle) Mackerel flapper or Pout. You are now fishing for Ling and Conger at the same time and if there is any tide going you might need that 2lb lead. If Cod are the target, reduce it to a 6/0 pennel rig with 50lb trace. For big Bream that reside on the wrecks, step down to a smaller paternoster rig or simply use baited mackerel feathers. 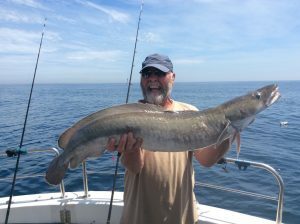 But for an easy rig that will handle Cod, Ling and Conger just stick with a sliding ledger to to 150 – 200lb mono trace and a large O’Shaughnessy hook. Job Done!